A month ago I went to Russia. Uh-huh. That place where “evil Putin and f**king cold weather” is. "You’ll get robbed, or killed. "— at least someone told me so before the trip. In fact, Russia is probably the most misunderstood country ever. Perhaps I am familiar with its culture, I was more excited than being worried. You can’t classify Russia to any continents, neither Asia nor Europe. This over a thousand-year-old country has complicated and mixed cultures from both the western and eastern world, making it too unique to belong to any continents. Surprisingly, the same theory applies to the fashion style in Russia. I stayed in St. Petersburg for over a week and a few nights in Moscow, so it’s safe to say the outfits I saw on the streets reflect the true Russia fashion taste. It’s a no-brainer that age is essential to our wardrobes. Yet I wasn’t expecting to see the Scandinavian style being completely adapted to the white-collared women, while the teenagers or 20-something dressing exactly like the mannequins in Bershka. As if the city is precisely divided into two groups— the Scandinavians and fast fashion teens. It isn’t difficult to figure out the reasons: geographically, big cities in the west Russia are so close to north Europe that not only people have easier asses to goodies but also fashion tastes. Monki, COS, Ecco and H&M, fashion brands from Denmark or Sweden, are so popular among white-collared women. (NO, not each of them wears 10cm high heels to work but YES, they all look stunning.) Around 9 am, I could see women in casual blazers, silk blouse, and dark trousers, holding a cigarette in hand (Russians are crazy about smoking.) walking to the office. They finish the look with white sneakers or black loafers. Simple and chic, not overly professionally dressed, and the colors aren’t something too bright. Gosha Rubchinskiy, THE famous Russian designer, has deeply, widely and thoroughly shaped the sub-culture in teenagers, making streetwear the main element in Russian teen fashion. The playfulness and rebel spirit it represents has inspired so many Russian streetwear brands such as СПУТНИК 1985, Юность, Аутло and Sorry, I’m Not. 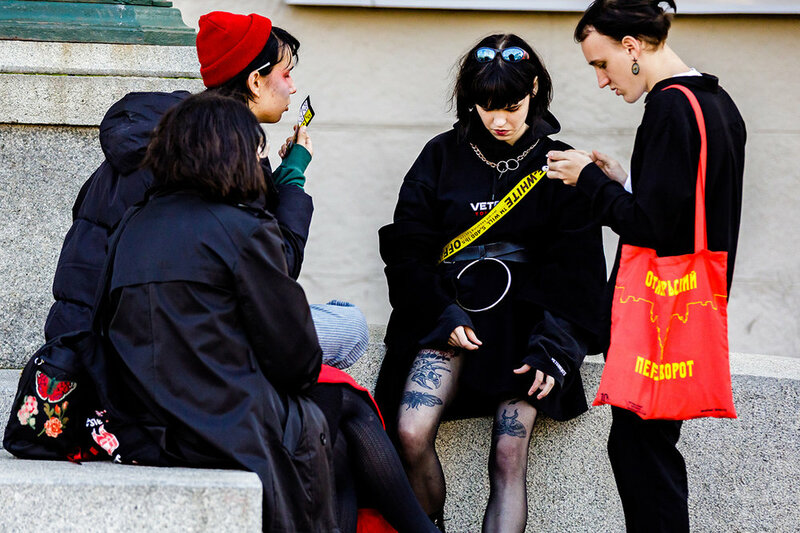 Off-White, Vetements and Yeezy are also top brands in the list that rich Moscow teens go after. The reason I titled them as “Bershka Kids“ is that Russian teenagers dress as if they just walked into Bershka and pulled off whatever were on the mannequins. They go for head to toe full on 80-90’s style— chokers, mom jeans, and chunky sneakers, or basics— leather/ denim jackets, white T-shirt and wide leg pants. These young people also tend to emphasize the figures by adding the belt or belt bag over blazers. (Just like what they do to the models. Duh!) Teenagers like to dye their hair to fit in the fast fashion trends. I’ve seen so many weirdly stylish hair colors like pale pink, light green and bright blue. There are even more stylish people in nights. White-collars would change into a leather jacket and higher heels to go for a drink with friends. Kids on Nevsky Prospect are even more streetwear—long 90’s vintage color-blocking coat, loose pants and chunky sneakers. High heels are the must to the crazy night out, along with the cleavage-showing bodycon dress. I am not a clubbing person, but every early morning I walked through a street filled with clubs and drunk people. Women lining up together for group photos and the men would be standing aside smoking. I am beyond happy to see Russia have developed such a modern fashion taste and the young have been paying attention to how they dress. To know fashion is to know our identities. We choose to become who you are by dressing up. In the country where appearances play a key role in any kind of relationships, Russians have developed their own ways to be remembered, or simply, just to have fun through fashion. The style is formed, the challenge is how to stand out from this fast consuming fashion world? How to let the world to know at first glance: “This is Russia fashion for sure”? The future is bright for Russia’s fashion industry, and she sure know the key to the bigger world.